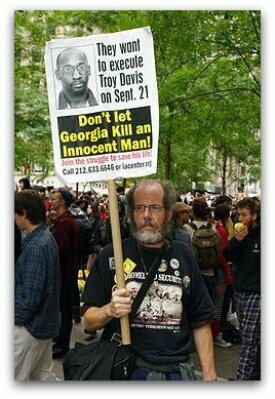 Troy Davis was executed yesterday for a crime he denied committing. Amnesty International had a petition of over 1m signatures protesting against the unsafe conviction. Even the Pope weighed in with a plea to prevent the killing. There was a massive international campaign protesting this man’s innocence – even the witnesses who helped seal his conviction withdrew their testimony, saying they were wrong. Yet, the eight judges of the US Supreme Court disagreed with the massive weight of international opinion; they said that the life of Davis should be terminated and a couple of hours later he was dead. It seems strange that a handful of people – albeit legal experts – are so divergent from the rest of opinion. But that is probably why they did not change their minds. When the weight of opinion is so one-sided people on the other side of the argument find it much more difficult to change their viewpoint. This is confirmed in new research from Hewlett Packard which looked at the way social influence changes our minds. And it is not as simple a picture as some people in the world of social media would have you believe. It turns out that the psychological concept of “reactance theory” is significant. This essentially means we stand firm in our beliefs because we feel threatened in some way by the opposition. However, we are less stubborn if the opposition is comparatively small – the risk of changing our view is much less, hence we are more prepared to move. The Supreme Court Judges yesterday would doubtless argue they looked at the case purely on legal merits. But psychologically, changing their firmly entrenched position was a massive risk to their autonomy simply because the opposition to the Davis execution was overwhelming. Online, the phenomenon of reactance is an issue that many people are falling foul of. Here’s what happens. Companies use social media to gain supporters for their products and services. They seek out “likes”, “fans” and positive reviews with five gold stars. There are even mechanisms by which you can ensure you get the maximum numbers for your products and services with all the right badges giving out signals that what you sell is just brilliant. This is following the notion of “social acceptance theory”. People are – for the most part – rather sheep-like. If other people are doing something, we tend to join them. If loads of people are “liking” your products, then many more could well join them and boost your income as a result. Almost all activity in social media is based on social proof. But this new HP research shows that reactance counteracts this. When your online product offering has a mass of people saying it is brilliant and only a tiny number of people giving you a couple of gold stars instead of five, then convincing people to buy becomes MORE DIFFICULT not less. That’s because the people who are doubtful don’t want their opinion changed – they dig their heels in thanks to reactance. So, in order to boost your online sales you actually want FEWER people saying you are brilliant. Don’t chase the numbers. What you need are some people who give your products a couple of gold stars and only a few more that say you are brilliant. It seems that a balanced approach is much more likely to get people to want to shift from doubt to acceptance. If you want to use social media to gain social influence for your products and services, you need to do so in a measured way, so that there is not such a massive weight of opinion in favour of your products or services. Otherwise the people who haven’t made up their mind about you will stay undecided – in fact, stubbornly opposing what you have on offer. To them it looks too good to be true. The shame is that for Troy Davis and his grieving family the weight of opinion was almost certainly not too good to be true.